What is so brilliant about Perfect Layers Rulers? NO MEASURING! Perfect Layers Rulers are designed with a patented “catch lip” that simply "bumps" up along the picture. The ruler hooks onto the edge of the image, giving the precise border or mattting measurement you want! 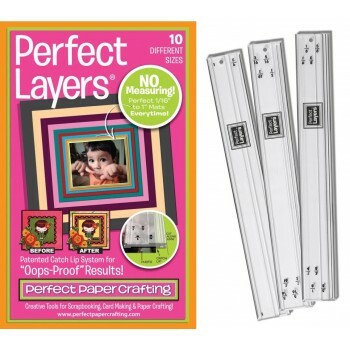 Perfect Layers Rulers are a MUST if you want to create perfect borders, mats, frames and layered effects on your scrapbook pages. Or for perfect thin margins around key elements on cards, or any paper crafting project.